Happy Monday Y’all! We hope you had a fun and safe fourth of July and are well rested for the week ahead. The heat is reaching those high summer temperatures now making indoor projects my new favorite kind. It did ease up a little bit one day this weekend which allowed me to finish up a few things outside of the house. I’m starting to understand why being in the third trimester during the summer isn’t the ideal situation. The long weekend allowed me to tackle a couple of craft projects that haven’t been at the top of our priority list but have been weighing on my mind to complete for some time. For two of the projects (coming soon – I can’t wait to share them with you!) I needed the documents that I was using to go from stark white to antique. 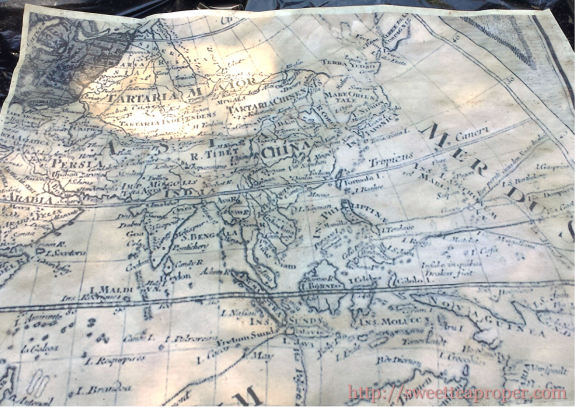 When working with paper, it is very easy to make documents look old with one simple technique – tea and/or coffee staining. This process can be beneficial any time you need to make a document appear aged, whether for home decor crafts, school project, or just for fun. There are two main ways to do it, but then several additional things you can do to make the document stand out. Tea or coffee staining is an easy way to give the paper an aged and vintage-feel with little effort. Depending on what you are using the paper for will determine which method is best for you. *STP Tip – Since tea and/or coffee doesn’t just stain paper, it is important that you lay down some kind of plastic protective sheeting before you begin. I decided to tea stain my project on our patio and still cut open a garbage bag (reinforced with weights on the edges) just in case the tea bled through the paper. 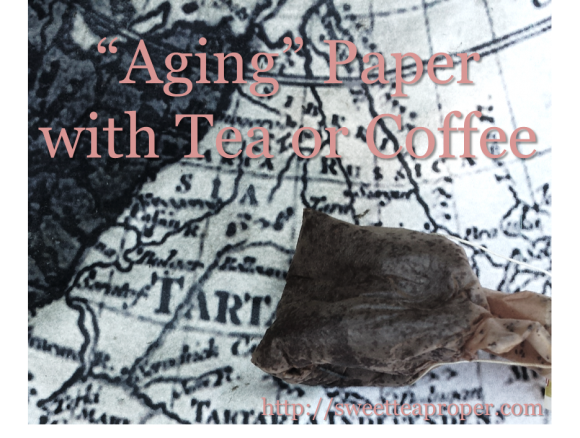 Whether you use tea or coffee to stain paper is merely a personal preference. The only coffee that we carry in our house are K-Cups, and at those prices, I wasn’t going to go that route. Tea, on the other hand, is relatively cheap and we had plenty of family-sized iced tea bags on hand. One of the big decisions to make when staining the paper is how dark you want it. For a darker stain, you will want to brew the coffee or tea stronger (with less water) and also let it sit for a while to deepen the color. The length of time the paper absorbs the water will also help to bring a richer more defined color. Regardless of which one you decide to use, at the very least, wait until the stain reaches room temperature to avoid any burns from using tea or coffee that is too hot. The two main ways to stain the paper with tea or coffee are either by dipping the paper or blotting the paper. Dipping the paper involves submerging the entire document into a container of brewed tea or coffee and letting it either lay flat to dry or hang dry. This method is ideal if you want the paper to have a clean solid-colored appearance. *STP Tip – Since paper is prone to tear if you decide to dip the document you will want to use a slightly heavier grade of paper especially if you plan on hang drying. Slowly submerge the paper into the tea or coffee leaving it in long enough to fully absorb the color (for a light stain, it should only take a minute or two). Gently pull the paper out of the tea or coffee stain and either lay flat to dry or hang dry with clothes pins. The other method to stain paper involves blotting the paper with the brewed tea or coffee to give the paper an aged appearance. As with dipping the paper, you will need to brew the tea or coffee. For my project, I had six large sheets of paper to age. I selected one large cup of water from the Keurig (which is probably about 12 – 16 ounces), and two family-sized tea bags. If you are using tea, you can use the tea bags to blot the document. If you are using coffee, you will need to get a small sponge or cloth for the next step. Once your area is secured with protective sheeting, lay your documents flat on top. Lightly ring out one of the tea bags (try not to rip the bag if possible) and begin to blot one section of the document. I like to start in one corner and work my way around to the whole document. 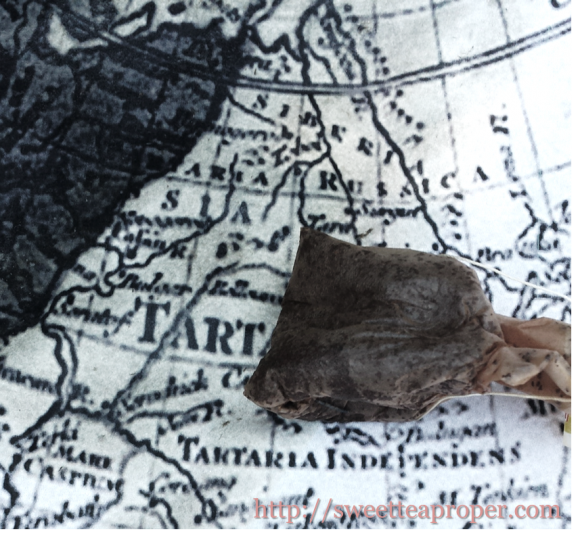 Continue to dip your tea bag in the “stain” and blot the document until the entire paper is covered with the tea or coffee. The one crucial thing that you do not want to do is leave a spot white. Too dark or too light in a section isn’t a big deal, but a white spot will make the document look inconsistent. 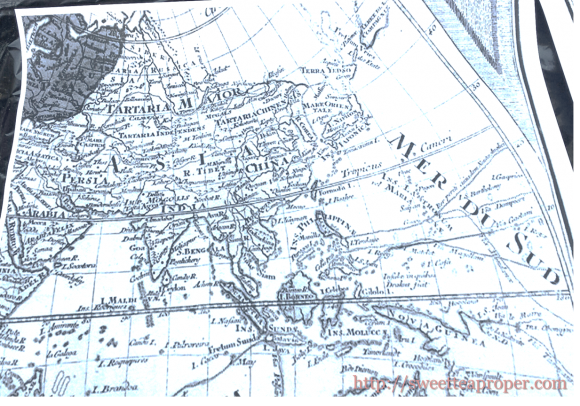 Before – This is a 16 x 20 piece of a map. It was printed at Office Depot. The paper that is used there is just slightly heavier than the printing paper usually used for home use. Below is the start of the blotting using the tea bag. You can see the color just lightly changing. Ta da! The completed document is finishing up its drying time outside in the sunlight. Blotting the paper with the tea bags allows you to let some of the tea settle in certain spots which gives the document a less uniformed appearance. You can still achieve uniformity by blotting, but you will have to make sure to wipe the paper if small puddles form. This is a matter of preference only. Both ways will achieve an aged appearance. Whether dipping or blotting the paper, let the paper fully dry before attempting to move it. The paper can easily tear when wet, so it’s best to let it fully settle before going forward. If you accidentally tear the paper (small tears now, not the entire document), don’t sweat it. Depending on what you are using the paper for, this could give it a little extra character. Once the paper is dry, you can also add character by burning the edges of the paper (perfect for a treasure map! ), adding wrinkles to the paper, or glazing with mod podge. Try a few sample sheets of paper before using your final document to make sure you will achieve the effect that you are going for. Now that you know how easy it is to stain paper with tea or coffee, we’d love to hear how your project turned out in the comments section below!